I’ll write a proper post about Mashed08 once I’ve caught up with work, but in the meantime I wanted to quickly share a couple of pics. 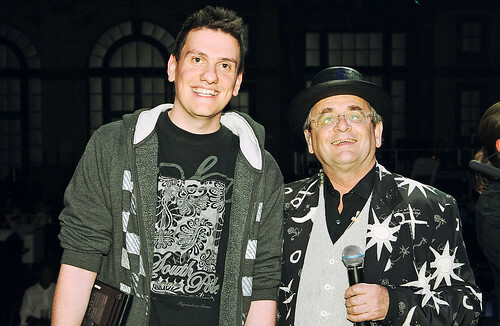 Sylvester McCoy was on stage as compere for the presentation of our hacks, and each of us who presented got to meet him briefly for a pic. 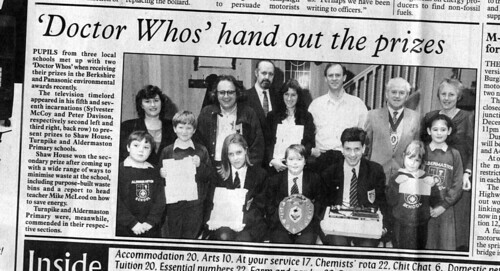 This was actually the second time I’ve met him – fourteen years ago, I got to meet him with a couple of others from my school when we won an award for an environmental project at school. This entry was posted on Monday, June 23rd, 2008 at 9:12 am and is filed under misc. You can follow any responses to this entry through the RSS 2.0 feed. Both comments and pings are currently closed. Cool shot – did you have time to mention the fact that you’d met him before? I see you managed to get Peter Davison last time, too. So Mashed sounds like it was a lot of fun – look forward to hearing more.